Soylicious.com offers a great new home candles business opportunity that offers consultants 40% commissions on sales, 40% discount on purchases, and many different, fun ways to earn money from home. These ways include direct sales, selling online, home parties, fundraising, and building a team to earn residual income paying 6 levels deep. No experience is required, even if you've never owned your own home business before! Excellent training and support is provided to all Soylicious consultants. You'll have access to our online company forum as well as our team training site. My name is Marsha, and I'm a mom to two young men and a Soylicious candles consultant in California. I have been working from home since 1993 and became involved in direct sales in 2006. In 2009 I discovered Soylicious.com Candles, and my passion is now helping other moms and women achieve personal AND financial success with their own Soylicious home candles business. If you've ever thought about starting your own home candles business, you're definitely in the right place at the right time! Soylicious.com offers a great opportunity to start your own home candles business with quality soy candles and other products at an affordable cost for you and your customers. Since Soylicious.com launched it's direct sales program in July 2009, our team has become one of the largest and fastest growing in the company! 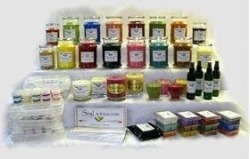 The owners of Soylicious.com are experienced candlemakers who have been making candles for 10+ years. In July 2009, they launched their directs sales program, now with over 100+ Soylicious consultants and growing FAST.